It's Friday and global markets are all in the red. Are you prepared? 1. Sour stocks: There's a negative mood across global markets, though U.S. stock futures are staying relatively steady. Stocks in China took a major tumble Friday, with both the Shanghai Composite and Shenzhen index dropping by 7.4% and 7.9%, respectively. 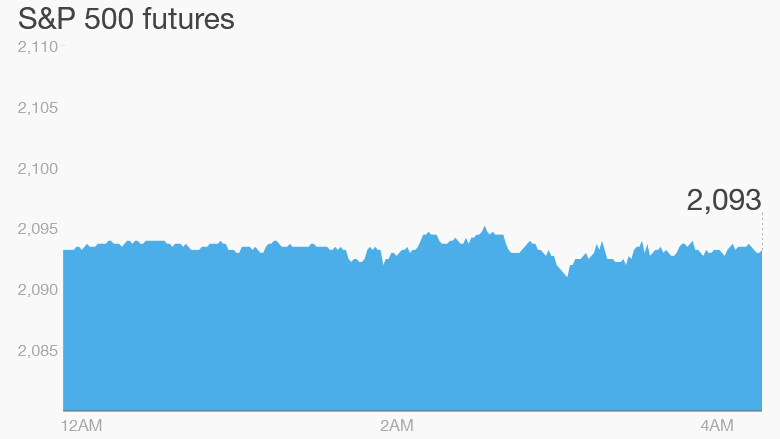 The dramatic moves could further unnerve investors, who are already reeling from last week's dismal performance by Chinese stocks. But even with the recent correction, the Shanghai index is still up 30% this year while Shenzhen's gains amount to 77%, easily making it the world's top-performing index. European stock markets are sinking as investors worry about Greece's potential default next week. Top European officials are meeting over the weekend to try to hammer out a last-minute debt deal. "There will be a crisis meeting over the weekend, because a European crisis is not a proper European crisis without a crisis meeting over the weekend," explained Paul Donovan, a senior economist at UBS. The CNNMoney Fear & Greed index shows there's a fair amount of fear in the markets right now. 2. Stock market movers -- Micron Technology, Nike, Humana: Shares in Micron Technology (MU) are plunging by 12% premarket after the chip manufacturer reported quarterly results that fell short of market expectations. But it wasn't all bad news. Nike (NKE) shares are up about 3.5% premarket after it reported quarterly results that outperformed analysts' predictions. Shares in health insurer Humana (HUM) could be on the move again Friday after Bloomberg reported Aetna (AET) is closing in on a deal to acquire the company. Humana shares surged by 7.1% Thursday. 3. Earnings: Shoe retailer Finish Line (FINL) will release its latest earnings ahead of the open. Its stock price is down 10.5% from last year. 4. Economics: The University of Michigan releases its monthly Consumer Sentiment Index at 10 a.m. ET. 5. Thursday market recap: It was a negative day for stocks on Tuesday, but the losses were muted. The Dow Jones industrial average dipped 0.4%, the S&P 500 lost 0.3% and the Nasdaq shrunk back by 0.2%.